In preparation for Open That Bottle Night (live, only on Palate Press; Saturday, February 26 from 7 pm – 10 pm EST), contributing editor Erika Szymanski shares some thoughts on the bottle she plans to open for the event. Where: my apartment, with a friend or two, out of my mismatched garage-sale wine glasses. Why: Because when else is a “starving grad student” going to open and drink a bottle of wine list priced at $185? On the one hand, the friend who gifted it to me suggested I drink it immediately. On the other hand is my hang-up that so precious a bottle should be saved for a special occasion. Enter Open That Bottle Night, the ideal non-occasion occasion. How: Now here comes the tricky part. 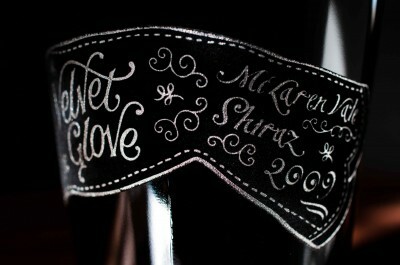 The Velvet Glove is a big, rich, chocolaty Australian Shiraz. I had the great pleasure of tasting this wine on the occasion of its North American debut, at the North American Wine Bloggers Conference last summer in Walla Walla, Washington. My trusty wine tasting notebook proved superfluous when it came to this wine. For me, at least, this is the definition of over-the-top Australian Shiraz: fruity, hot, bold, tobacco-laden, chocolate richness. What to eat, then? Will it surprise you if my mind doesn’t immediately leap to steak, lamb, or barbequed buffalo? Strangely, when I think of the richness of the Velvet Glove, the last thing I want is more richness. I prefer my birthday cake sans ice cream and my pancakes minus the butter and maple syrup, too, so perhaps it’s just me. Still, I think that a lovely but quiet assistant—in the form of a huge pile of grilled asparagus and zucchini batons with homemade aoli, perhaps—is just the backdrop that the Velvet Glove needs to work its magic without getting in the way of the real action. Besides, lamb shanks might make this feel like a genuine special occasion, and that would ruin the evening. This February 26th is going to be all about opening a $185 bottle of wine for no occasion at all. WOW- we are thrilled that you have chosen the ’09 Velvet Glove as the bottle that you will share on Open That Bottle Night. I’m just like you- I tend to save bottles like the Velvet Glove for some unknown future special occasion, but Sparky & Sarah agree with your friend. Just drink it, they say! So, for this reason, this bottle is a perfect choice for OTBN- Enjoy! I was very pleased to find http://www.palatepress.com.I wanted to thanks for your time for this wonderful read!! I definitely enjoying every little bit of it and I have you bookmarked to check out new stuff you blog post.